Want to add rustic charm to your home? Would you like to proudly display how much you love coffee? Burlap coffee bags from Winans are a great way to decorate your home and showcase your love of java! After emptying them of their beans (did you know coffee beans are green before they’re roasted?!) we sell our burlap coffee bags for $5 at Miami County Winans stores. These bags are great for creative home crafts and DIY projects. 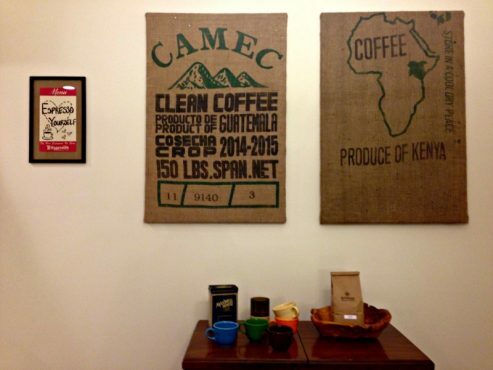 We’re going to show you how to make some burlap coffee bag art to adorn your walls. This DIY is a great introductory project for working with burlap. Check out our Pinterest board, DIY: Burlap Coffee Bags, for more crafty ideas! Gather your materials – let’s get crafty! The first thing you will need to do is cut your burlap to fit your canvas frame. The frame that we used was 24 x 36 inches. We were able to cut our burlap bag down the left and right seams and the bottom seam, essentially separating the front of the bag from the back. What size you need to cut your burlap will be determined by the size of your canvas. Be sure to save your scrap burlap for other crafty projects! To attach the burlap to the canvas frame, we started by taping the burlap to the back of the frame with masking tape. Starting in the center of the top of the frame and working out, we alternated between the top and the bottom of the frame, periodically checking to make sure we liked the placement of the burlap on the frame. While taping the burlap down, you will need to secure it with a few staples from your staple gun. Also be sure to carefully stretch the burlap before stapling so it is taut as you work back and forth. Repeat this entire process on the sides of the frame, again starting in the middle and working your way out, alternating between the left and right side. When you have the all sides attached and are sure you are happy with the placement, finish securing with more staples from your staple gun again making sure it is taut before stapling it down. This is what your burlap should look like from the back once all of the sides are taped and stapled in place. We frequently checked the front of the frame to make sure the text on the bag was centered. Once the burlap is taped and stapled to the canvas frame, it’s ready to adorn your walls! We paired two framed burlap bags with this DIY – Vintage Menu Board, the tutorial for this dry erase board can be found on This Ohio Life! Burlap is a tad messy! The natural fibers shed so be prepared to do a little sweeping when you’re done with your DIY project. Burlap comes in a wide variety of textures. The finer the weave of the burlap, the more pliable the fabric is, which makes it easier to work with for this project. If there is a small tear or stretched hole in your burlap, seal it with Fray Check or a similar liquid seam sealant to prevent the hole from getting larger.